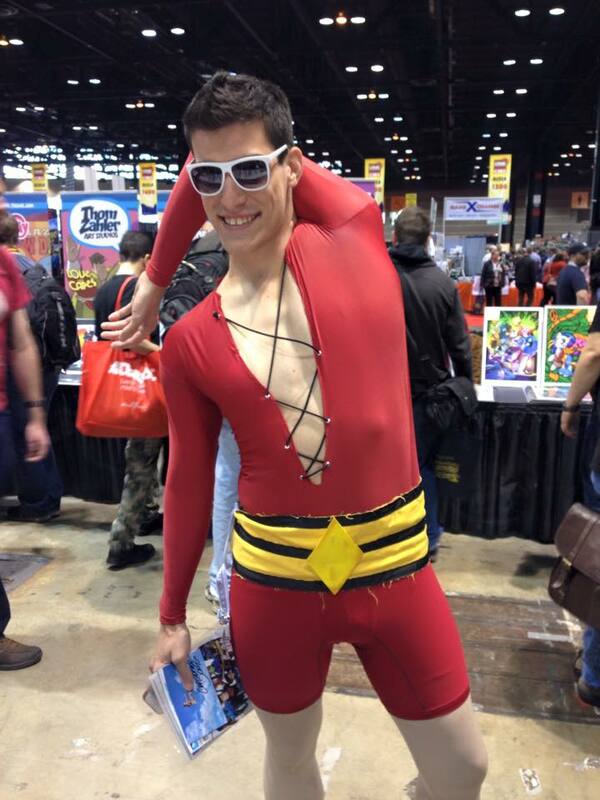 Plastic Man shows up in the Bendy City! The Chicago Comic and Entertainment Expo wrapped up this past weekend, and it upset me for two reasons: First, I’ve never been to what I hear is a great con in one of my favorite cities, and secondly, I was missing a chance to see Luke Daab. Daab is an exceptionally talented guy, knocking it out as an illustrator and designer, a singer and songwriter, and even a puppeteer, and he had his work on display at this year’s C2E2 for his first Artist Alley appearance. If you’ve ever been to a comic con, you know that sometimes the best way to see something special is to stay put and wait for it to walk by, and this was certainly the case for Daab. In between talking to customers and fellow pros, he also shared periodic C2E2 updates on his Twitter and Facebook accounts, and who do you think should make an appearance? Aw, yeah! 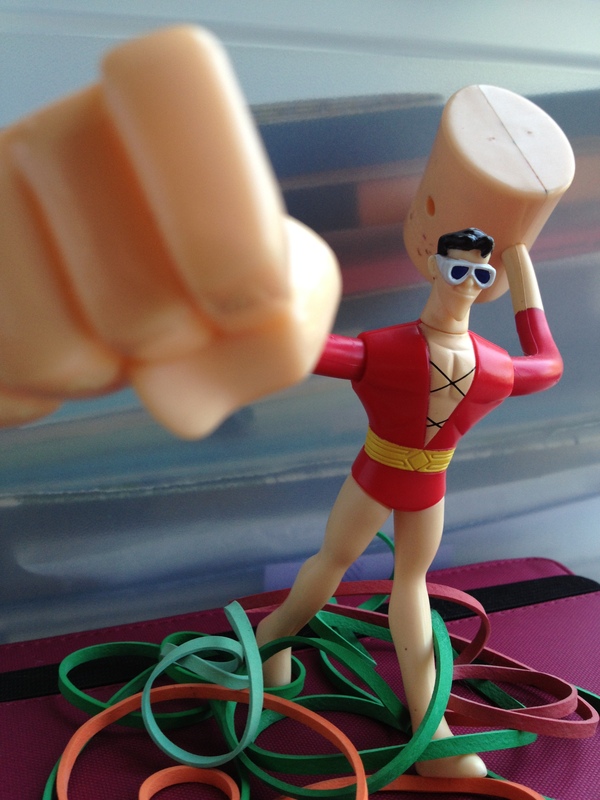 He may not be as commonplace as Superman or Batman (or Harley Quinn, for that matter), but Plastic Man still shows up here and there and usually right around the time you realize you haven’t seen him in a while (just like in the comics!). This particular Plas is great, not just for the arm-bending contortions, but also for that grinning mug! Look at that guy – he looks like he was designed by JLA-era Doug Mahnke! Big thanks to Luke Daab for passing along this photo! Go see more of his work at his site, Daab Creative and then follow him on Tumblr! It’s Woozy Wednesday! Let’s give him a hand! When Woozy Winks made his first appearance in Police Comics #13, he already shared something in common with Plastic Man: When fate (or in this case, a wizard with less than stellar swimming skills) gives him extraordinary powers, he’s faced with the choice of whether to use his new abilities for good or evil. 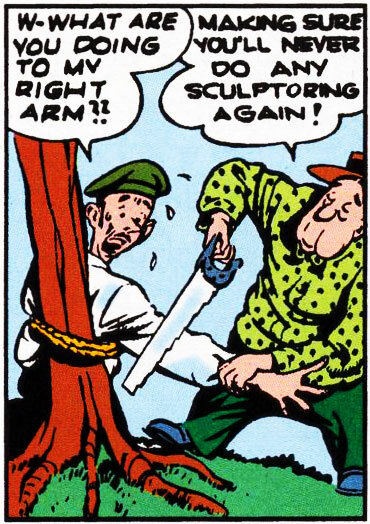 Before any of that happens, though, I’d like to point out that Woozy is TOTALLY GOING TO CUT THAT GUY’S ARM OFF. It’s Woozy Wednesday! 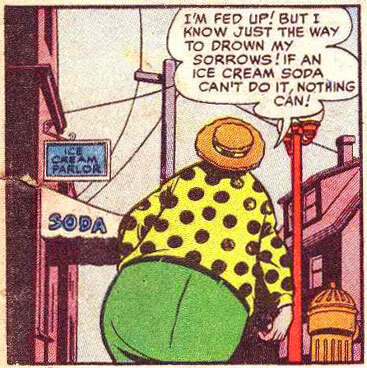 And it’s time for ice cream! It’s pretty obvious Woozy has got this whole life thing figured out.